Thiruvananthapuram health inspector who carried out an inspection, however, said it was unclear whether the Technopark had in fact released the sewage. 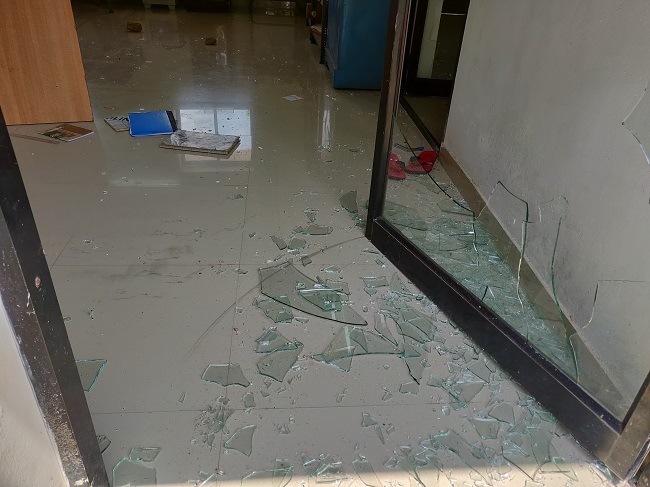 The window panes were broken, the glass doors inside the building were smashed to pieces, tables and chairs were overturned or in disarray inside the room. The heavy stones that were used for the vandalism also remained. 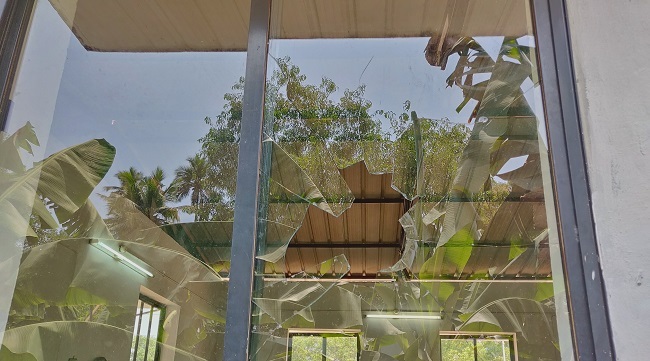 This was what was left of the Sewage Treatment Plant (STP) operation room at the Technopark phase III in Kerala’s Thiruvananthapuram after angry residents stormed the building on Sunday night. Public anger had been mounting against the IT park’s STP for allegedly releasing sewage water into the Thettiyar stream, which begins from Ananthazhchira and joins at Moonnattumukku near Kazhakootam, where the IT park is located. It was past 7 pm on Sunday when residents in the Kulathoor area started to get a stench on the shore of the Thettiyar stream. According to 54-year-old Ayyappan, a resident of Kulathoor, this stench was not a new phenomenon for the people there. And they knew where it was coming from. “Many times in the past, we have experienced this stench and we are sure that Technopark has released the sewage water from their plants into the stream,” Ayyappan alleges as he stands near the Kulathoor bridge under which the stream is situated. Standing on the bridge, small pools of black was seen floating on the surface of the stream, although the smell had subsided by Monday morning. TNM caught up with A Ajayan, health inspector of Thiruvananthapuram corporation, who also inspected the plant and the areas near the stream on Monday morning. 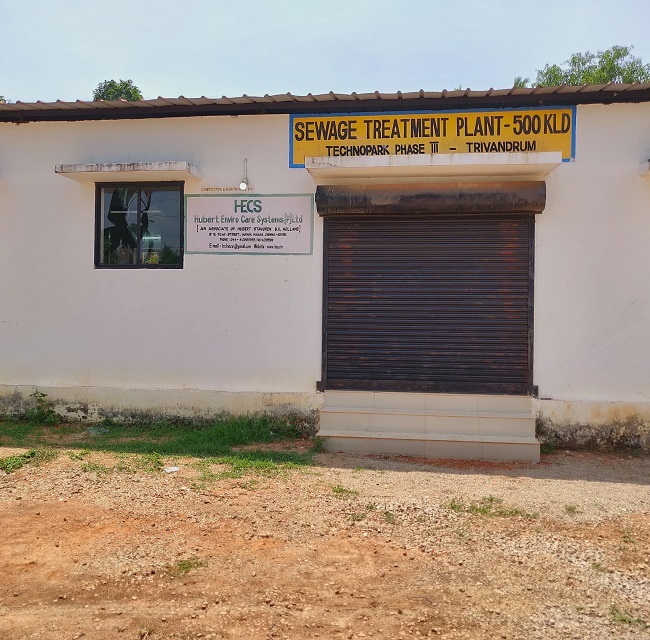 “Around 8:30 pm, angry locals barged into the STP operating room and smashed the window panes and glass doors inside the STP operating room after they couldn’t bear the stench caused due to the sewage,” said Ajayan. But Ajayan was quick to emphasise the fact that he is not sure if the sewage was released from Technopark. “Kazhakootam is a highly commercial area now and from where the stream starts, till where it ends, there are residential apartments, restaurants and other companies on the banks of the streams. Earlier, we have found out that whenever it rains, some of these residential apartments nearby will open their sewage plants and release it into the streams. It rained on Saturday, so we doubt that it is because of this as well,” Ajayan stated. But the residents of Kulathoor are more than convinced that the sewage was released from Technopark, one of India’s largest IT parks, run by the Government of Kerala. Broken window pane at the STP operation room. “I am an employee of this organisation but I have to say this, there are times when sewage has been disposed by the plant here and it used to smell really bad. I used to live close by and sometimes, we had to throw away our food as we couldn’t eat because of the stench from the sewage from the plant,” alleged the security official. “The very fact that the health inspector said that he is not sure where the sewage came from despite inspecting the site confirms that it was not released from our plant,” a senior official from Technopark tells TNM. “But I get it. He has his limitations. He was being given directions to give us a stop memo regarding the plant but since he knows that the sewage was not released from the company’s plant, he has limited the action by just providing a notice,” the Technopark official stated. He went on to say that Technopark is a company which is run by the Kerala Government and if residents had any issue or complaint against the company, they had other platforms to raise the issue, rather than turning to violent methods. “We are ready to make improvements but yesterday’s attacked that was targeted at us was for no fault of ours,” he added. He alleged that even the plant operators were threatened by residents if the incident were to happen again. “The technopark authorities, given the severity of the issue might go for a police complaint. I’m not the one to decide this,” he added. The senior official also went on to add that they would never do anything to cause harm to their surroundings. “Only if we keep our surroundings clean, will companies come to Technopark. We are at a stage where companies like Nissan is opening their offices here. We will not take any shortcuts anywhere,” he emphasised. The clean-up of Thettiyar is being carried out by the Thiruvananthapuram corporation together with citizen groups. The city corporation along with the district collector had conducted various inspections along the Kazhakootam area and various cleaning drives were initiated to revive the stream.